Raptors are an unusual success story of wildness thriving in the heart of our cities—they have developed substantial populations around the world in recent decades. But there are deeper issues around how these birds make their urban homes. 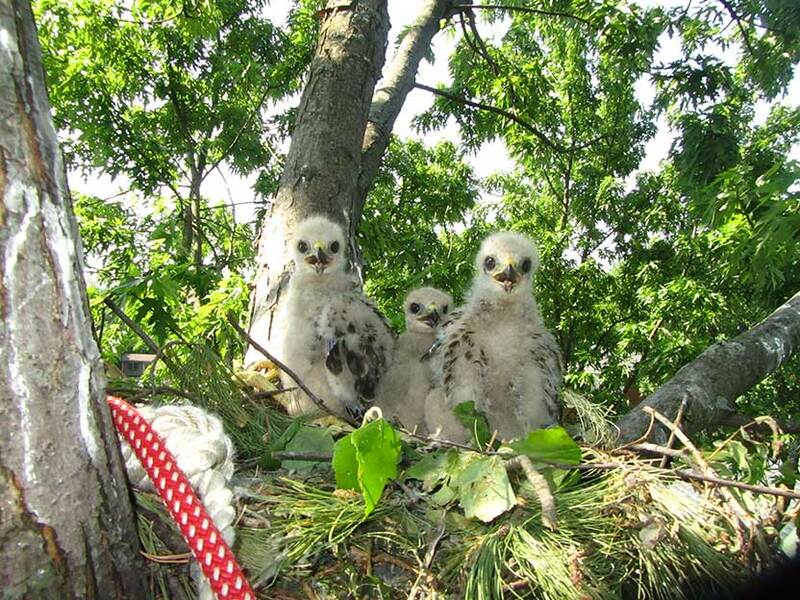 New research provides insight into the role of raptors as vital members of the urban ecosystem and future opportunities for protection, management, and environmental education. A cutting-edge synthesis of over two decades of scientific research, Urban Raptors is the first book to offer a complete overview of urban ecosystems in the context of bird-of-prey ecology and conservation. This comprehensive volume examines urban environments, explains why some species adapt to urban areas but others do not, and introduces modern research tools to help in the study of urban raptors. It also delves into climate change adaptation, human-wildlife conflict, and the unique risks birds of prey face in urban areas before concluding with real-world wildlife management case studies and suggestions for future research and conservation efforts. 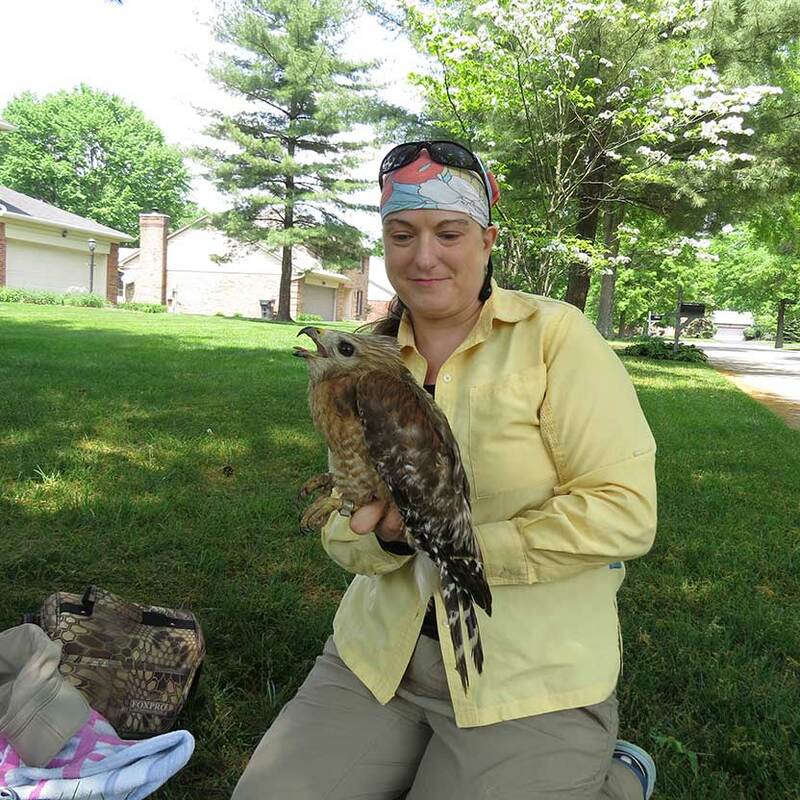 Boal and Dykstra have compiled the go-to single source of information on urban birds of prey. Among researchers, urban green space planners, wildlife management agencies, birders, and informed citizens alike, Urban Raptors will foster a greater understanding of birds of prey and an increased willingness to accommodate them as important members, not intruders, of our cities. 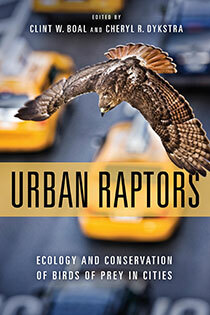 "Every section of the book is worth reading...Urban Raptors has the potential to be a tremendous resource and reference for anyone curious about the ecology of birds of prey in urban environments." "The editors, Clint W. Boal and Cheryl R. Dykstra, assembled a heavy-hitter list of authors who intimately know urban raptors from years of hands-on work climbing nest trees in residential yards, relocating birds from airports, or interfacing with the public on behalf of raptors. This book will prove useful as a reference for future research and as a hands-on guide for solving human-raptor conflicts." "Authoritative and engaging...The strength of Urban Raptors is its ability to quickly bring the scientist up to date on our understanding of charismatic, apex avian predators...I recommend Urban Raptors to a broad readership. Experienced scientists will find a cornucopia of novel adjustments to urban life by birds we rarely consider innovative or behaviorally flexible. Students will be led to exciting and approachable research questions with conservation implications...The lay reader will also find much to enjoy as they learn about the variety of diurnal and nocturnal predators that share their world." "The book is informative and and is an important read for students and academics researching urban raptors...I would certainly recommend this book to anyone wanting to know more about raptors, urban wildlife or birds in general." "Valuable reading for raptor enthusiasts, enthusiasts conservationists, and anyone interested in engaging stakeholders." "Urban Raptors is a single source for information on urban birds of prey....outstanding and nicely illustrated." 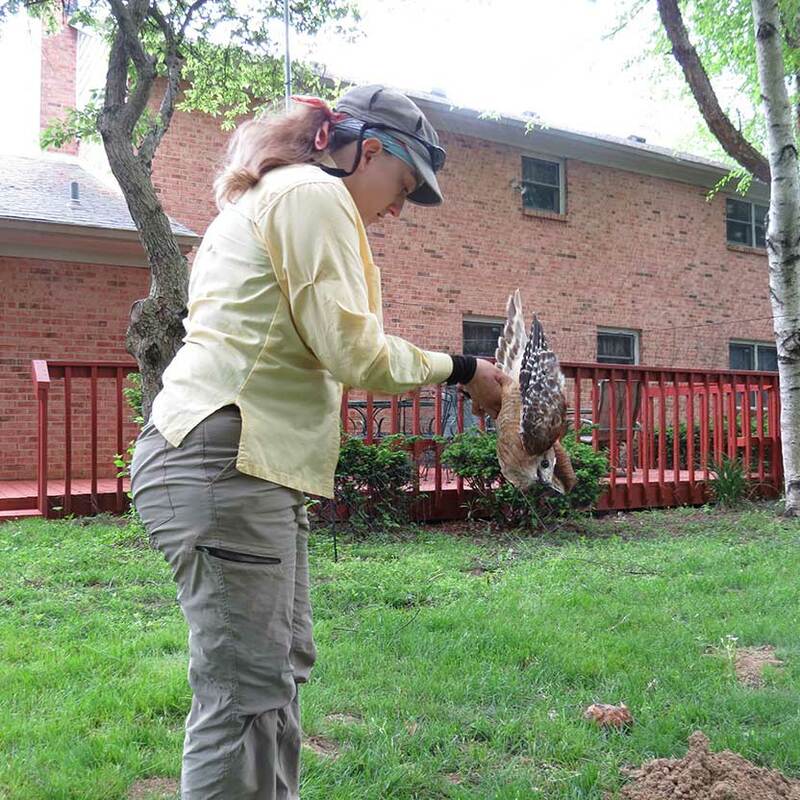 "Drawing on experts from around the world, Urban Raptors gives readers—wildlife professionals and birders alike—a thorough foundation into the lives, ecology, and conservation of the birds of prey that increasingly share the developed landscape with humans, from peregrine falcons nesting on skyscrapers to burrowing owls in the housing tracts or Cooper's hawks and barred owls in suburban backyards. Both authoritative and accessible." Scott Weidensaul, author of "Peterson Reference Guide to Owls of North America and the Caribbean"
"Urban Raptors is an important book, remarkable for being the first to compile valuable knowledge for everyone from urban planners to wildlife agencies and bird watchers. While mass extinction is under way globally, it is helpful to understand that some species, including top predators, can flourish in human-dominated landscapes while others can be vulnerable in unexpected ways." "Humans and raptors have successfully coexisted in towns and cities for thousands of years. Urban Raptors builds on this history and sets us up for success in the future, providing readers with a wealth of information on how raptors nest, forage, and survive in modern urban landscapes." 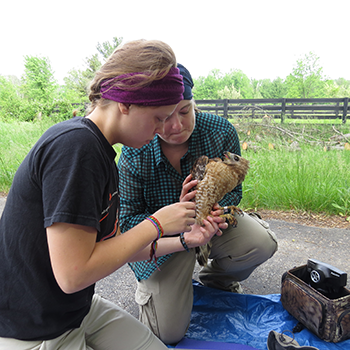 Today was the first day of this year for banding nestling red-shouldered hawks in our suburban study area in Cincinnati, Ohio. 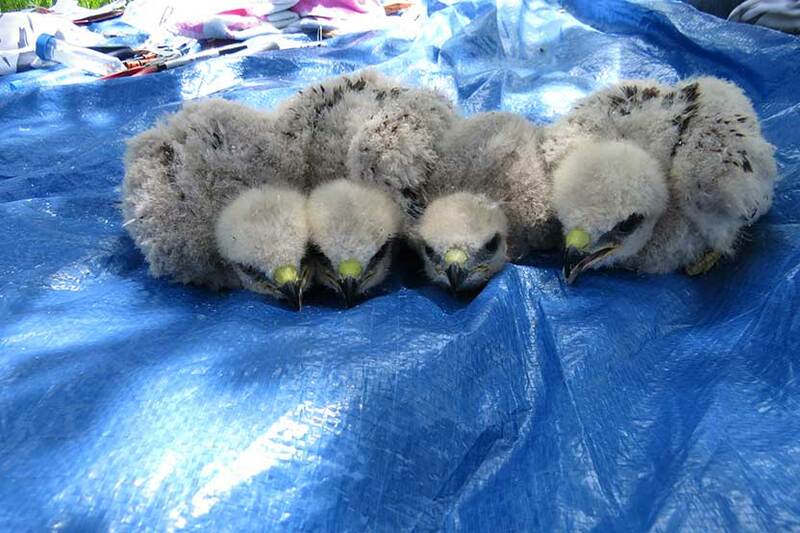 Even after 21 years and more than 2,500 nestling hawks banded, the first day is still fun, full of promise, and excitement. 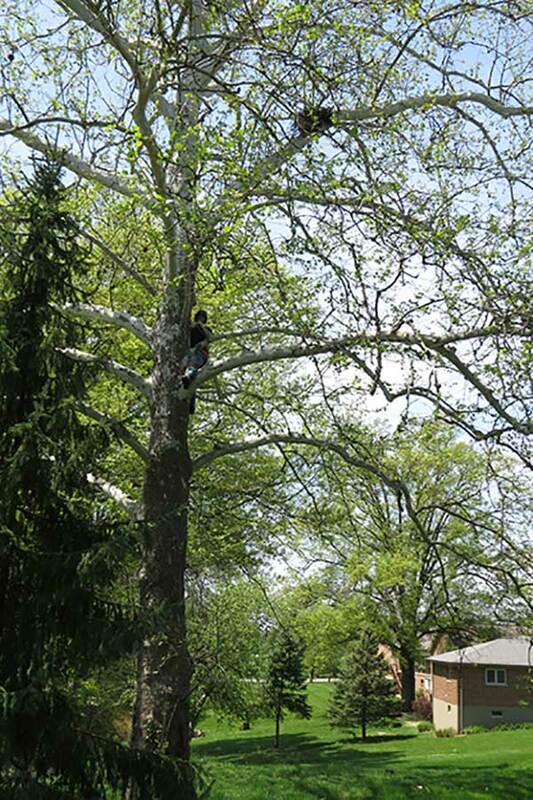 The first nest is in a sycamore in a suburban backyard, like a lot of our nests. 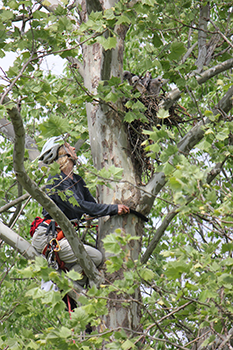 Jeff is the best tree-climber on our team, and he quickly makes his way up to this challenging nest. Ann and I set up the banding gear on a tarp on the lawn in the shade because the afternoon is sunny and nearly 80 degrees. With seven or eight landowners and neighbors looking on, we band the young with aluminum USGS bands on one leg and an orange color band on the other. We measure the first and second secondary to determine the approximate age; this brood of four young range in age from 1.5 – 2.5 weeks. 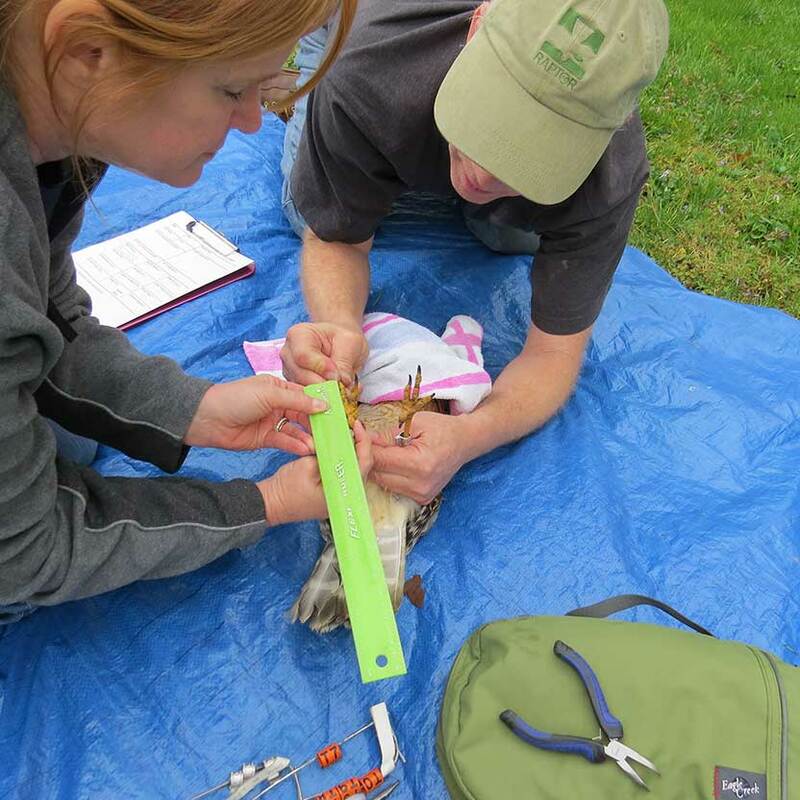 We have a grad student studying extra-pair paternity this year, so in addition to banding, weighing, and measuring the young, we need to get blood samples from the nestlings and both parents if possible. 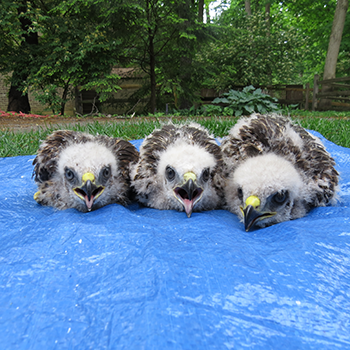 The nestlings, all banded and sampled, rest on the tarp before being returned to their nest. I place the nestlings in a canvas bag to return them to the nest, where Jeff has been waiting. At nest site number two, just a couple miles from the first nest, we are happy to see that the male we banded and took a blood sample from in March is still at the nest. From a photo, we read his band as Orange P4 Right. We put out a trap for the female, but she is uninterested; we’ll have to come back and try to trap her in the next couple weeks. 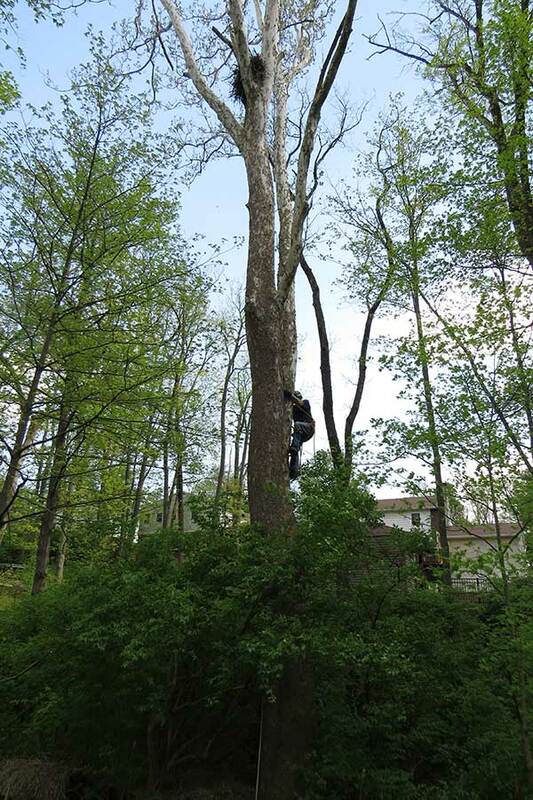 Jeff climbs the nest tree, another sycamore in another backyard. We get our blood samples from the two young in this brood, both approximately two weeks old, and get the USGS bands on, but then it starts to drizzle and we hear thunder rumbling as the expected storms roll in. We abort the rest of the measurements and the color-banding, in order to get the young back to their nest so a parent can keep them dry (and to get our climber Jeff back down out of the tree). Dodging rain showers for the rest of the afternoon and early evening, we manage to trap two adult hawks: a female at one nest site and a male at another site. Our trap is a new bal-chatri, and we’re pretty pleased with how it performs: both these birds get caught almost as soon as they come down to the trap. We run to the trap, and then gently disentangle the hawk’s legs and toes from the nooses; an interested landowner documents our work. 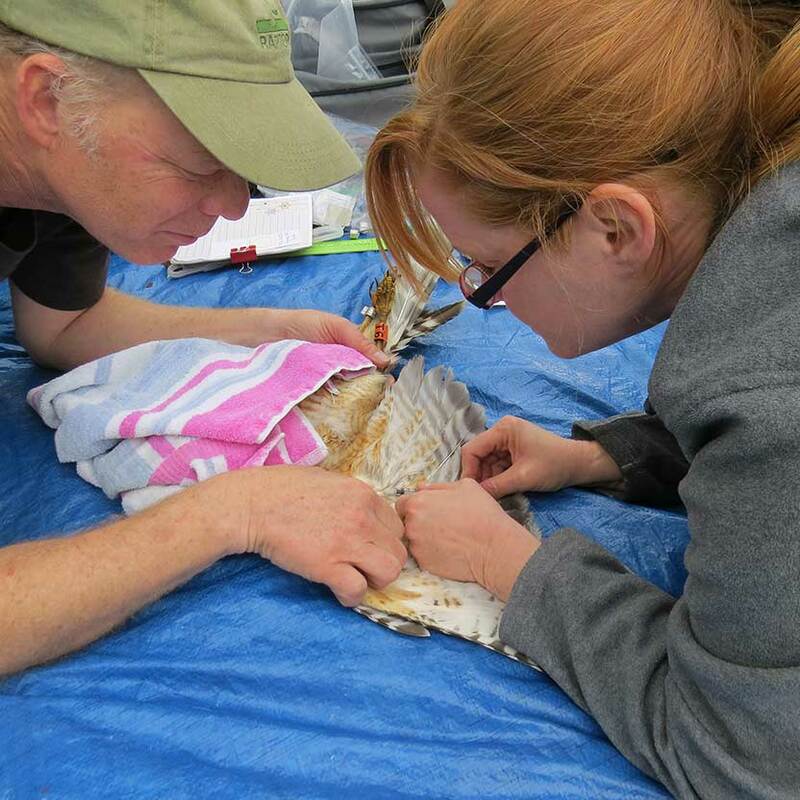 Rain starts up again as we are working on the female, really pouring this time; we are able to take her blood sample, and get the bands on, but we forgo the measurements and turn her loose. After we collect our wet gear and stow it in the vehicle, we check the nest (with binoculars from the ground). We’re happy to see that one of the adults is on the nest, protecting the nestlings from the pelting rain. 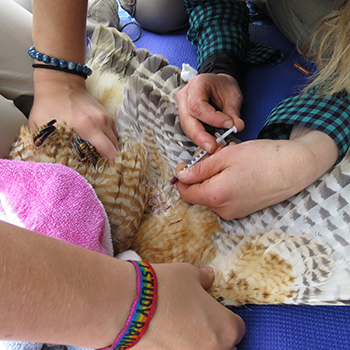 By the time we get to the next site and trap the male, the rain is over, and we are able to complete the banding, blood sample, and all the measurements. More landowners and neighbors gather to watch our work here; most are interested and supportive—it’s nice when residents are enthusiastic about raptors and we enjoy telling them about the birds and our research. All in all, a successful first banding day, 2018. Cheryl R. Dykstra is an independent researcher and consultant. 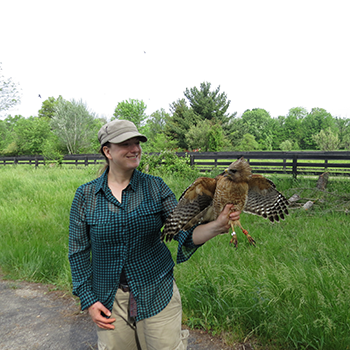 She serves as editor-in-chief of The Journal of Raptor Research and is co-editor of Urban Raptors. So happy our grad student Ania is back from Texas, having just finished her spring semester. Today is her second day, and the first day with our new undergrad intern Madison, a sophomore studying Environmental Biology. At the first nest, we are disappointed to find nothing but nestling feathers on the ground. 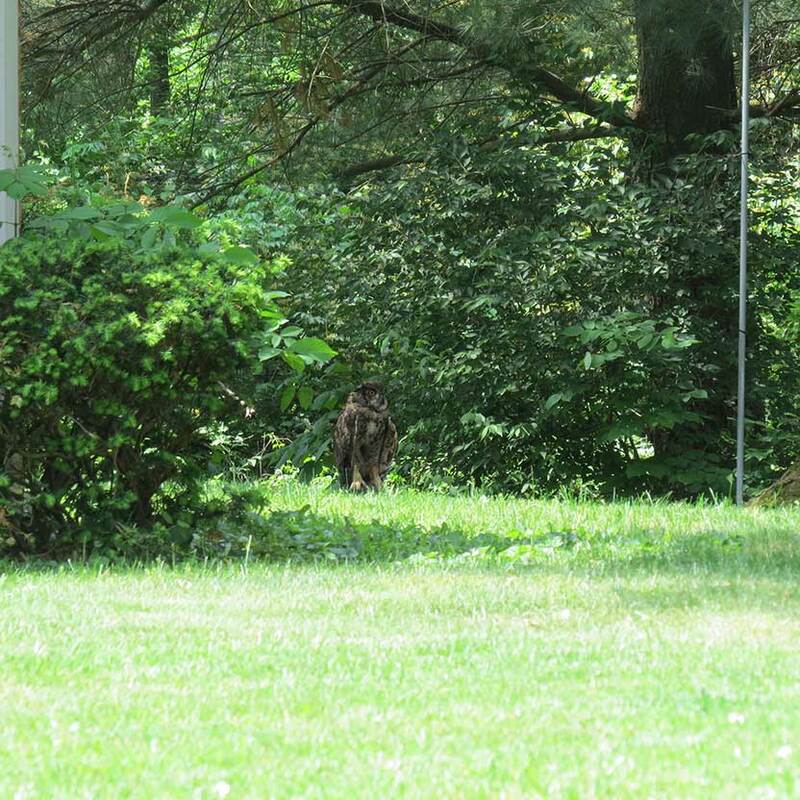 A predator, probably a raccoon judging from the feathers clinging to the sycamore’s bark, apparently killed the nestlings we saw here yesterday. One of the adults repeatedly flies into the nest carrying a fresh sprig of maple, looks around, then flies off a short distance. It would be anthropomorphizing to say she looks confused by the lack of young, but that’s what it seems like to us. The second nest is better. As we walk into the back yard, one of the adults dives silently directly over mine and Madison's heads. While I’m walking out to the middle of the yard, she makes two more close passes, coming within about five feet of my head. 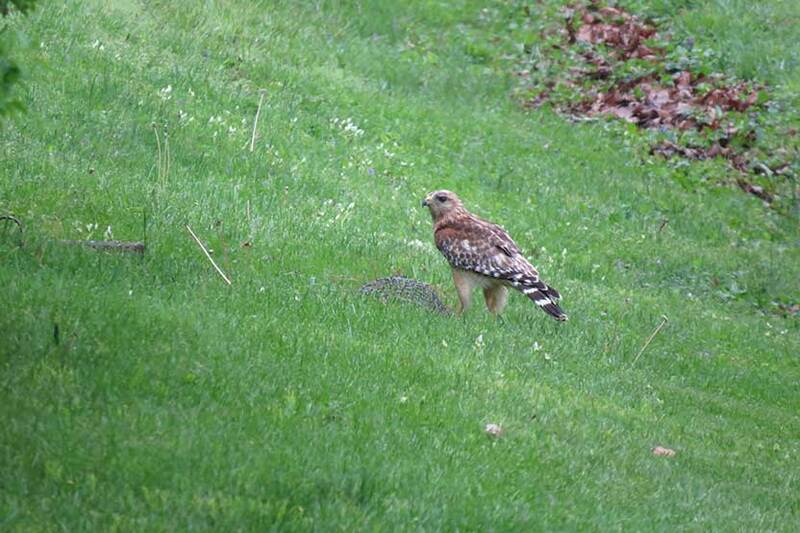 Interestingly, in more than 20 years of working with red-shouldered hawks, I have never had that happen before. The bird’s aggressive nest defense isn’t really a surprise, as the elderly couple who live here reported that the birds have hit them while they walked in their yard, and now the couple are terrified to go out. 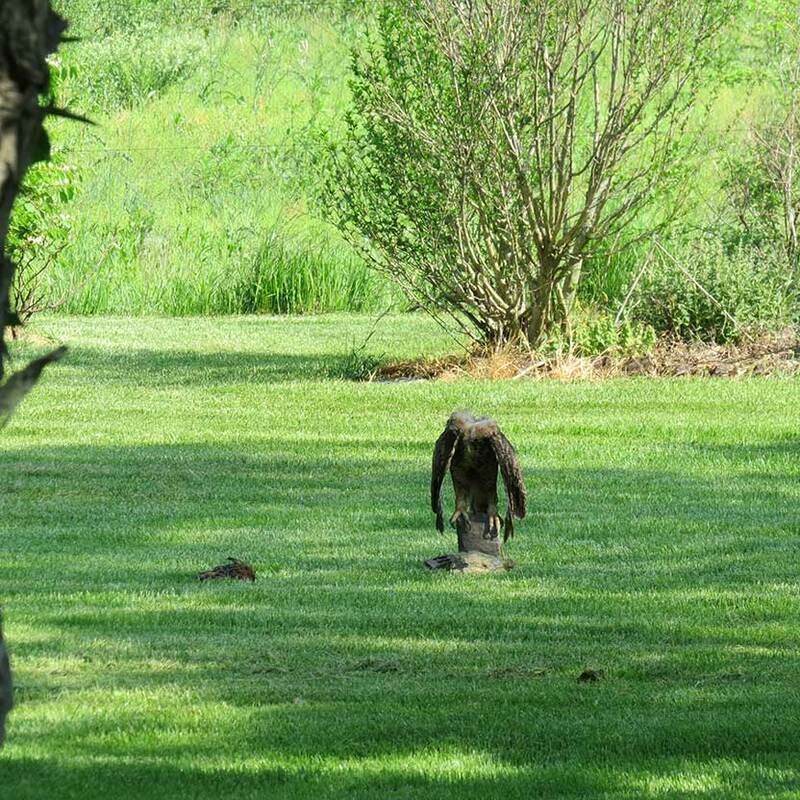 Vigorous nest defense against people on the ground isn’t really that common in Cincinnati—maybe 5% of the nests—but it can be troubling, especially when children or the elderly are involved. I put on my climbing helmet and hand one to Madison—I don’t want to risk our intern getting injured on her first day. It’s a day of firsts. We have a new “toy” we’re eager to try, a high-tech taxidermy owl with “robot guts” that make it turn its head and raise its wings. We set up an almost-invisible mist net next to the robotic owl in an area of the yard where we hope the hawks will see it. 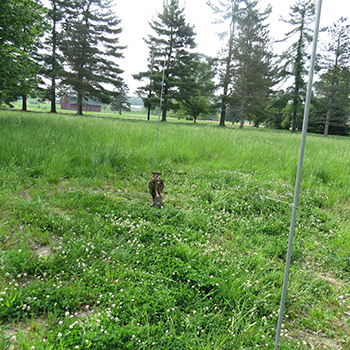 Hawks will often dive at great horned owls, which are significant predators in both suburban and rural areas, and researchers take advantage of this natural behavior when we need to trap them. 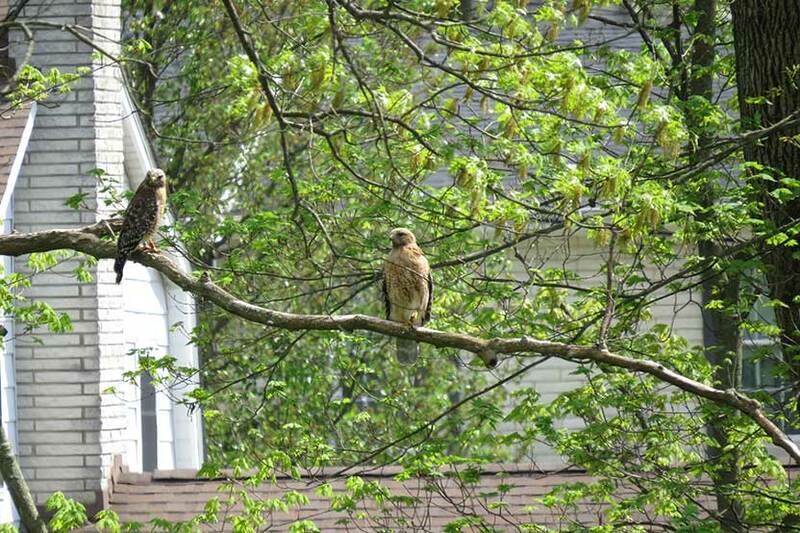 We retreat around the corner of the house and the parent hawks immediately began calling, and flying around, and then diving on the owl! They dive several times, more than once hitting the owl and knocking its (detachable) head off. Twice we get one in our net, but each time the bird quickly gets out and flies away. Discouraged, we give up, and move on to the next task. 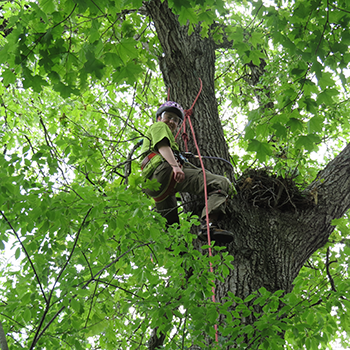 I climb the nest tree, a silver maple, and send the nestlings down to the ground for Ania and Madison to band and take blood samples. The adults haven’t given up their defense, and one of them hits me hard on the helmet as I wait at the nest. Just once though. 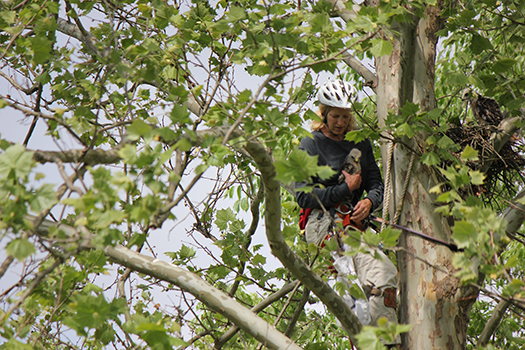 Getting hit while climbing is pretty rare too—only 11% of the Cincinnati birds actually strike the climber. Ania shows the nestlings to the landowners, who are sitting safely inside and watching us work through their kitchen window, and they agree the young are cute. Few can resist a baby bird. I return the young to their nest and rappel down. I promise the landowners that I will return in the summer after the young are done using the nest and remove it, in the hopes that maybe the hawks will move somewhere else next year. 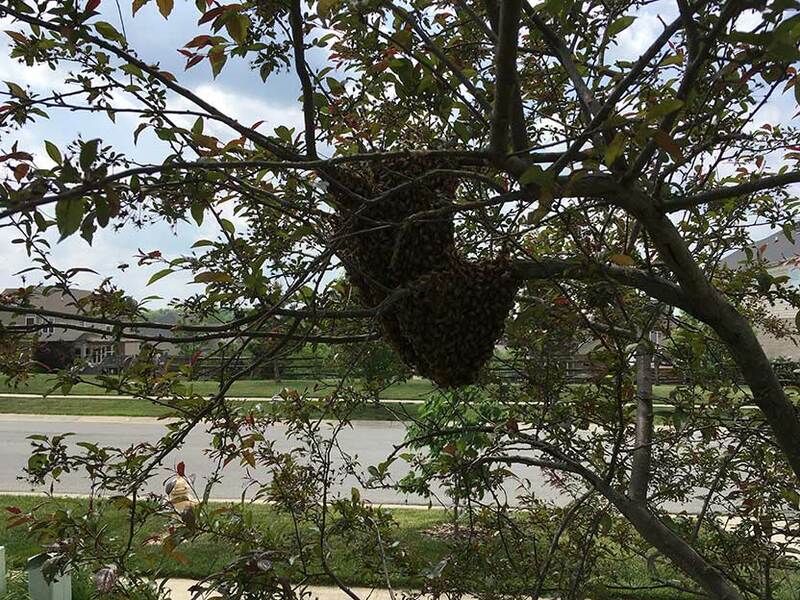 After a brief diversion (a swarm of bees in a crabapple tree, something none of us have seen before), we arrive at the third nest of the day. Here we have a great “set,” the net almost invisible, and more loosely suspended this time. We use the remote to make the owl turn its head and lift its wings and we play a recording of the great horned owl hoots. It takes a little while, but suddenly we see a bird rocketing in from the right. It’s caught! We run to the net and detangle it. We’re excited that the net has worked, but some of that joy drains away when we realize this is the male we caught and sampled two months ago. We examine him, weigh him, and let him go. Five minutes later, he’s in the net again. Again we detangle him and let him go. The female is still standing in the nest, watching the activities below. We decide to move on to banding the young. 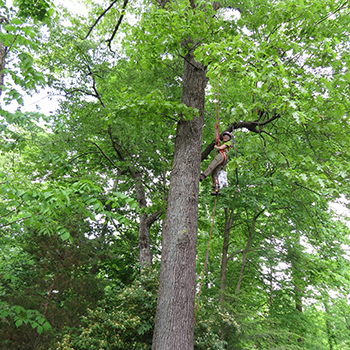 I climb the nest tree, a lovely white pine, and lower the young to Ania and Madison. I enjoy a comfortable seat on a branch just below the nest, and relax in the slight breeze at 40 feet high. It’s 90 degrees now, so the climbing was hot, sweaty work. 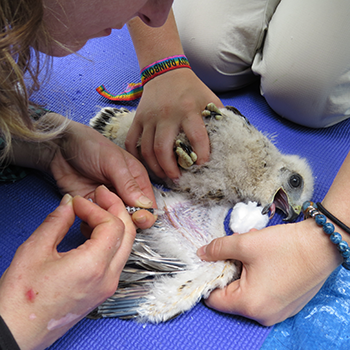 The team bands, measures, and weighs the nestlings, and takes a blood sample from each. 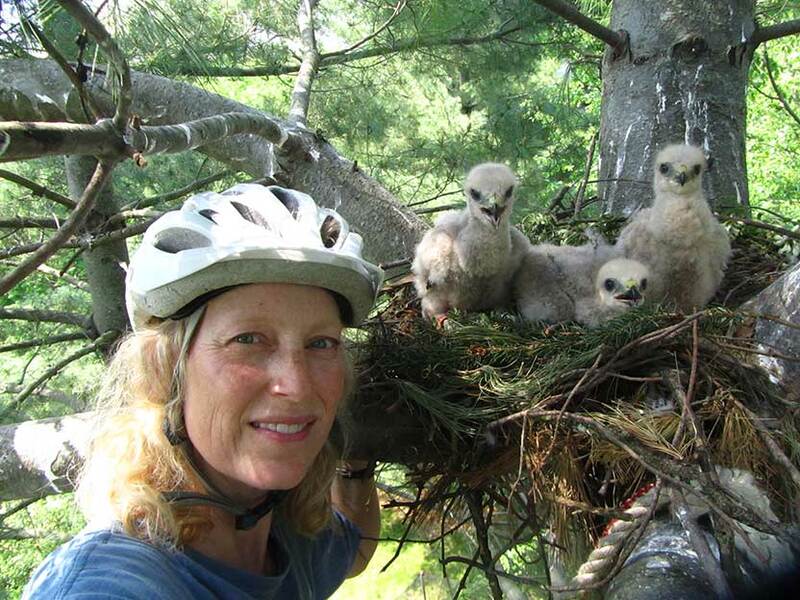 They send the nestlings back up to me and I snap a quick selfie, and then rappel down. All in all, it’s been a good day. Our first nest of the day is a little farther out from town than most, and on a large lot next to an equestrian training center. 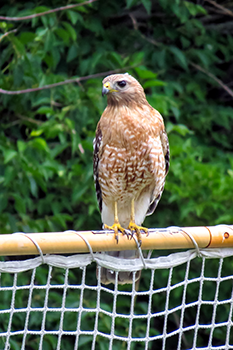 To us, the immediate habitat looks more suitable for a red-tailed hawk than a red-shouldered hawk, but we’re not hawks, and we’ve often been surprised by the adaptability of the red-shoulders. In Cincinnati, they’ve nested on rooftops and once on a gas grill on an elevated deck, just three feet from a kitchen window.We set up the owl decoy, surrounded by the mist net and the dho gaza, a net that collapses when a hawk hits it and gently drops the tangled hawk to the ground. They band and measure him. 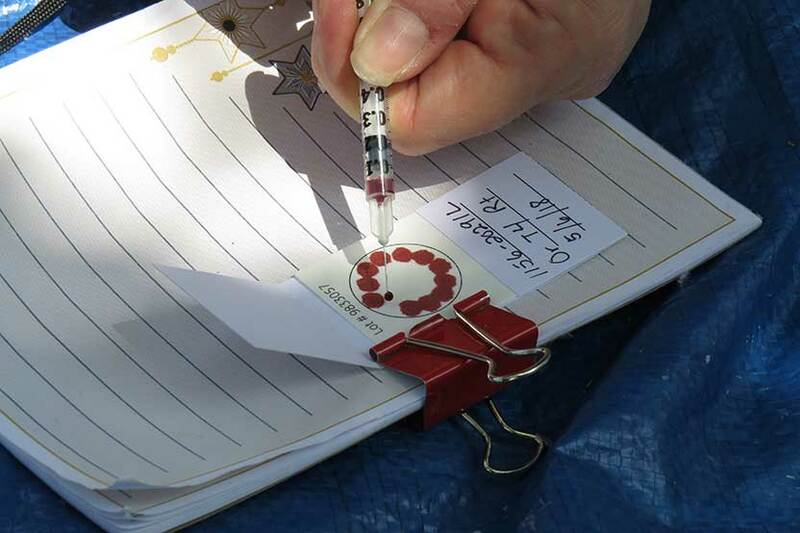 They collect a small blood sample. Then, he is released. The bird that escaped earlier is unwilling to engage again today, so we take down the nets. We’ll wait a week or so before trying again. 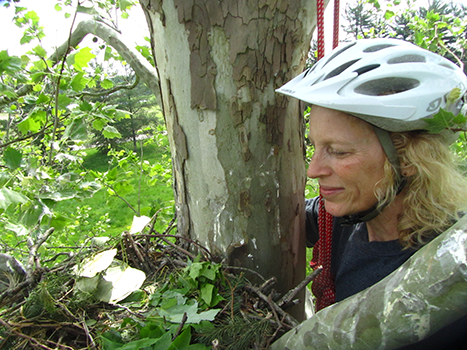 I climb the nest tree, a small sycamore with a low nest less than 30 feet off the ground. 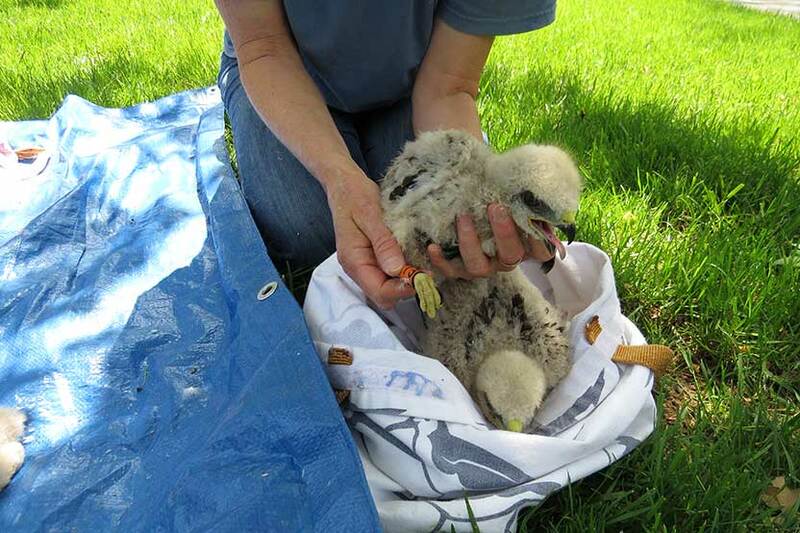 I remove the three nestlings from the nest and place them in a bag to be lowered to the ground to Ania and Madison. As Madison practices banding and measuring the feet and the secondaries, I relax on a comfortable branch and examine the nest while I wait. It contains something I’ve never seen before in a nest, many strands of long black hair, which I guess must be from horses’ tails. The nest also has a lot of green sprigs of several tree species: red cedar, white pine, spruce, red oak, red maple, silver maple, and a non-native I don’t immediately recognize. 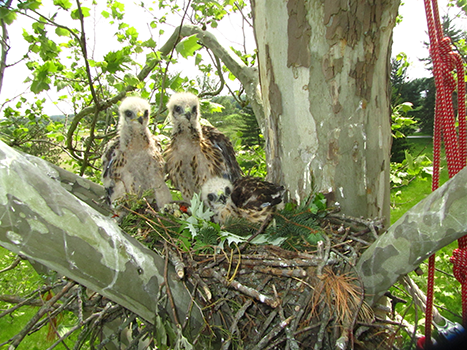 Red-shoulders and many raptor species line their nests with “greenery” like this; some species may serve as natural insect deterrents and help protect the young from parasites. 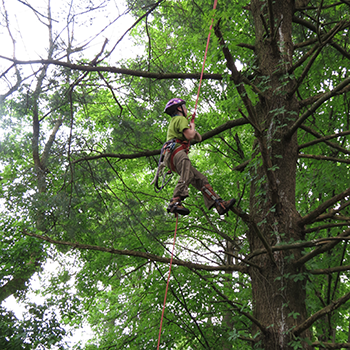 Ania and Madison finish with the nestlings, and I place them gently back in their nest and rappel down. The next nest is in a beautiful big oak, less than 20 feet from the homeowner’s garage door, and about the same distance from the neighbor’s house. My daughter Madeline joins us, having just finished her last exam. 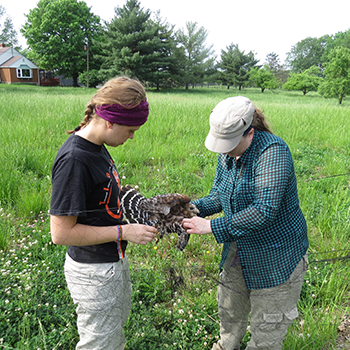 Madeline, 17, has been helping me with hawk research since she was very young and is excited to be allowed to do her first solo climb to a nest. This tree is perfect for the double-rope climbing technique she knows, and she uses a foot-ascender to quickly make her way up the rope, right to the nest. 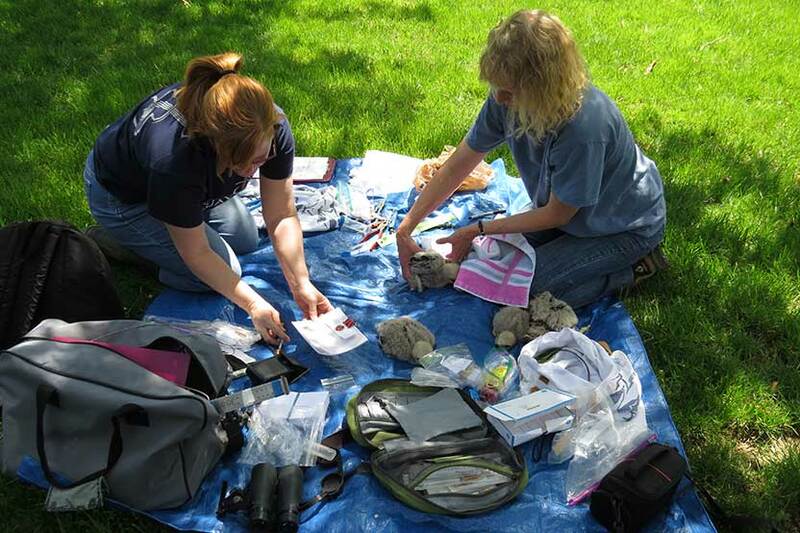 Ania and Madison set up the banding supplies, band the young and take their blood samples. These three are about 3.5 weeks old. We return the nestlings to Madeline, and she re-settles them into their nest, and descends the rope. She’s thrilled with her success. One of the advantages of the urban study area is the easy availability of snacks, so we break for ice cream and wait out a short rainshower. 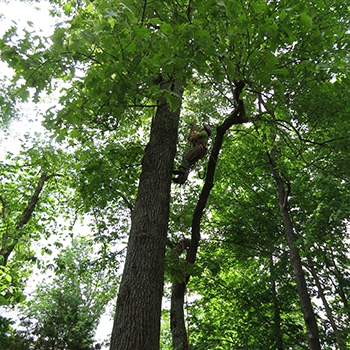 The next nest is about 40 feet high in a white pine in a wooded sideyard. White pine are not native here, but are widely planted, and red-shoulders have nested in this one for many years running. 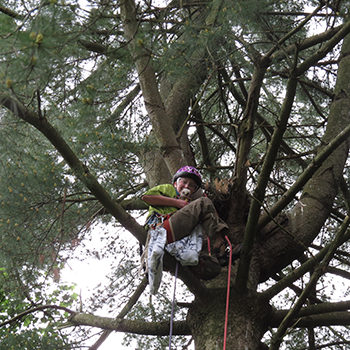 Madeline has climbed this pine with me while training in past years, and is eager to go up solo. As she ascends the rope, we study the young with binoculars. They are older than we thought, probably nearing five weeks old. Madeline gets to the nest, and begins quietly working her way around the nest, keeping her head down below the edge to avoid startling the young into fledging prematurely. We see her carefully retrieve two of them on the south side of the nest, then move to the north side and gently grab the other two. Smiling broadly, she lowers them to the ground. We band and measure the young, and collect the blood samples, working quickly because the sky is looking threatening again. We send the brood back to Madeline and she replaces them in their nest, and descends the rope. Everyone, including the lawn-service crew that stopped to watch our work, tells her she did a great job. She is exhilarated and proud (and so is her mom). Rain starts again, with thunder in the distance, so we pack up our gear and head home. We’ve banded and sampled 11 birds today—a great day.